At the outset of Bloodline, an emissary from the Twi’lek homeworld of Ryloth addresses the Galactic Senate, briefly explaining that his planet has historically been the target of Hutt oppression, and that this oppression was doubled under Imperial rule. Emissary Yendor goes on to explain that with the decline in power of the Hutts, other criminal factions – most notably cartels run by the Niktos – have arisen to fill the power vacuum. In particular, he notes that a Nikto cartel run by a Kajain’sa’Nikto (red Nikto) named Rinnrivin Di possess the greatest threat to the people of Ryloth, and beseeches the Senate to investigate Rinnrivin Di’s criminal activities. For those of you who have watched The Clone Wars animated series, and specifically the Season 3 episode “Supply Lines,” you may recall that the episode features a Kajain’sa’Nikto Jedi Master named Ima-Gun Di. Well, the moment I read the name “Rinnrivin Di,” the lights and sirens went off in my brain and I immediately wondered: are the two Nikto somehow related? Honestly, I have no idea. It certainly could be possible, but “Di” could also just be the “Smith” of the Nikto species. Still, it sure is interesting that the two have the same surname, and it really makes me wonder if Claudia Gray or someone on the Lucasfilm Story Group had the idea of connecting Ima-Gun Di and Rinnrivin Di in their OWN bloodline. But I don’t want to belabor the connection. It is definitely worth pondering, but I have another thought to consider about Ima-Gun Di and the Twi’leks, one that relies on a little more information found in Bloodline, and elsewhere, about the Nikto species. 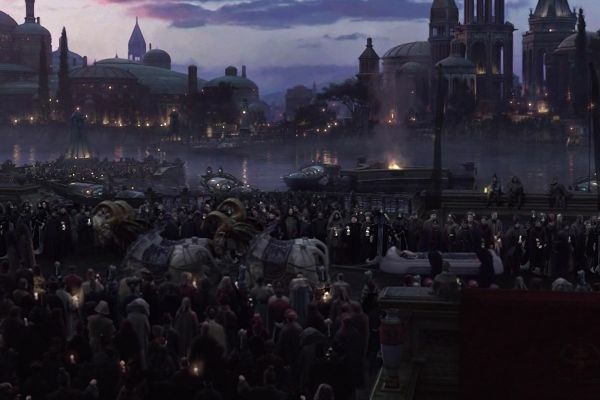 One piece of that information comes during Emissary Yendor’s address to the Senate, but it comes not from the Emissary but instead from c-3PO. 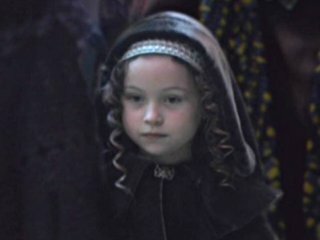 Turning to Leia as she listens to Yendor’s presentation, C-3PO states that “The Niktos served the Hutts for centuries. They’ve never had a truly independent government of their own. Hardly even a world of their own, really.” In fact, the first Niktos we meet in Star Wars appear in Return of the Jedi and are henchmen for Jabba the Hutt. Furthermore, we also see Nikto enforcers serving the Hutt Clan in The Clone Wars, and learn from Star Wars: Uprising that Nikto stalkers are utilized whenever Hutts feud with one another. So what the heck does all this have to do with Jedi Master Ima-Gun Di? Well, since the relationship between the Niktos and Twi’leks was tenuous at best, how then would the Twi’leks have reacted to a Nikto Jedi Master leading the defense of their homeworld? Imagine, for example, being a Twi’lek parent whose young daughter was ripped away from them by Nikto enforcers to be taken and made a slave in the palace of a Hutt. Now, imagine seeing a Nikto Jedi Master step off a Republic gunship – how would it make you feel? You see, as I read Bloodline and thought about the possible relationship between Ima-Gun Di and Rinnrivin Di, I also found myself thinking about the possible emotions the Twi’leks may have experienced seeing, or simply knowing, that a Nikto was fighting FOR them when their planet was under threat. I can easily picture the look of shock and/or surprise on the face of some Twi’leks when they first saw Ima-Gun Di, wondering if this Kajain’sa’Nikto was really to be trusted. Master Di speaks with Twi’lek freedom fighter Gobi Glie. But I’m also certain that Master Di knew that members of his species, working on behalf of the Hutts or in their own self-interest, were responsible for a great deal of Twi’lek suffering. As a Jedi Master and as a Nikto, Ima-Gun Di must have been aware of what his presence on Ryloth would mean to many Twi’leks. 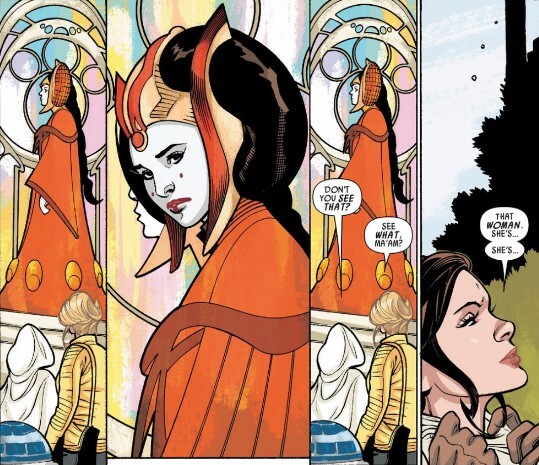 This is why I think it would be brilliant for a Star Wars writer like Claudia Gray to create a story – even if it is only a short story – that shows us Master Di’s arrival on Ryloth and his subsequent interactions with the Twi’leks before we meet him in The Clone Wars. 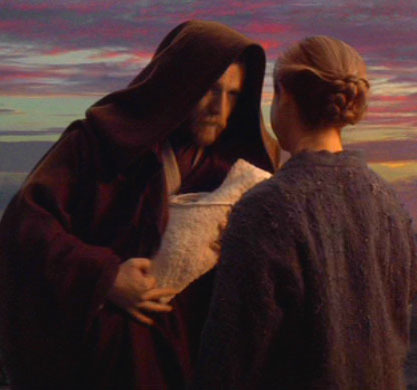 This story could provide a little background on an otherwise unfamiliar Jedi Master, insight into the beginning of the Ryloth campaign, but most importantly it could show us the compassion of Master Di as he worked to heal some of the pain the Niktos had inflicted upon the Twi’leks. Of course, this is not to suggest Master Di could single-handedly mend every wound, especially since he had a battle to fight, but perhaps his example and legacy could serve as the future for understanding and reconciliation between the Twi’leks and the Niktos.